The miniature that I'm presenting today was finished more than a month ago, but, as usual, the few time I have to spare has been dedicated to my university course (with no regrets!). Well, this Bilbo Baggins model is another one of those fun to paint minis, with lots of details and things to work on. 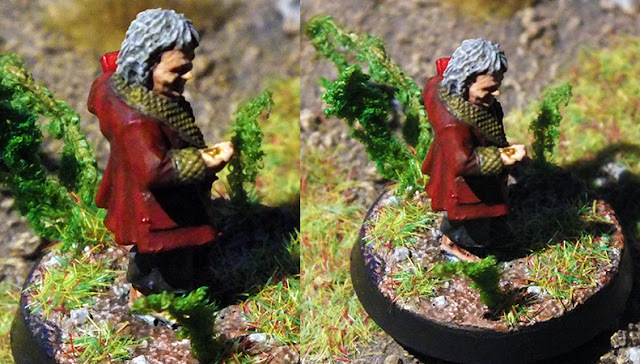 It's actually a really tiny model, which gave me a bit of an headache (just to think of the Bilbo from the Escape from Goblin Town I'll be painting in the future which is even tinnier... ). A picture with Strider, just for scale! 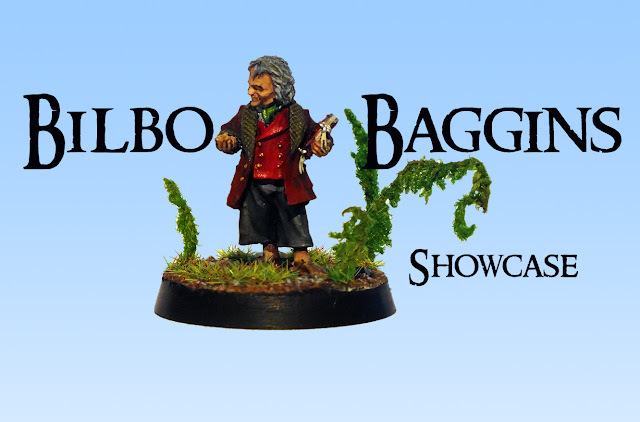 Bilbo really is small. On his left hand he carries the Red Book of Westmarch, while looking at the One Ring, on his right hand. Since it is such a little model, I've decided to exaggerate a bit on the vegetation of the base. I'l be surely posting the tutorial on this little guy as soon as possible, hoping you guys like it! Such a great miniature and I love what you have done with the basing. Very nice, actually really very nice.